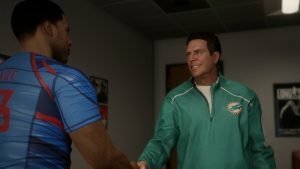 Madden NFL 18 (Xbox One) Review: A Single Player Campaign – It’s in the Game! There are a lot of things you can say about a company that has been voted the worst company in the United States on multiple occasions. I’m sure that most of what’s been said would need to be censored by the CRTC, but some of it must be praise. In a society divided by self-imposed lines it would be nice to talk about the good aspects of something for a change. For example, we could discuss Electronic Arts and how they are one of the few developer-publishers out there who still takes risks. Heck, give them a little credit for taking two chances on the Mirror’s Edge franchise alone. Their latest experiment, called Longshot, is the single player campaign for Madden NFL 18 that anyone can play from start to finish. It’s probably also the only thing you should care about if you are reading this review. If requested, I could go into detail about the new G.O.A.T. 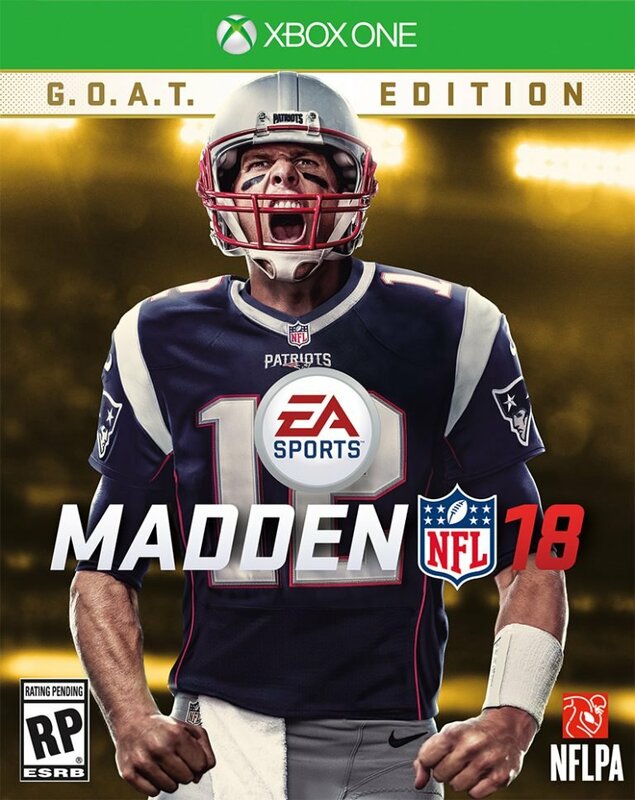 content for MUT, but chances are pretty good that anyone who cares about the Greatest Of All Time expansion for Madden Ultimate Team picked up their pre-order on day one. It’s also fine if you still don’t know what Madden Ultimate Team is because that means you are the type of person that the Longshot campaign was made for. The basic idea of this single player offline experience is that you take on the role of Devin Wade (played by J.R. Lemon, a former NFL player and current actor on a TV drama called The Night Shift) as he tries to re-enter the world of professional football. Along the way, Wade will be joined by a cast of motion captured characters that will present him with twists and turns, ups and downs, a few predictable moments, and a whole lot of heart. From time to time Longshot will even let you play a bit of football too. I am being facetious when I say this, but the truth is that a more accurate name for the Longshot campaign would have been TellTale’s the NFL; especially since a lot of your button pressing will involve quick time events and conversation trees. Longshot is not football, but a carefully created and executed story mode based loosely on today’s world of professional football. You will literally spend as much time watching the character of Devin Wade evangelize the game of football as you will spend controlling him in the pocket. It’s possible that 15 minutes might pass before Longshot requires you to press a button to continue the story—this isn’t a good or bad thing, but simply a fact you will have to accept. Another fact is that the Longshot mode might not be for you at all. While I did say that anyone can complete the Longshot mode, that doesn’t mean that everyone will like it. The character of Devin Wade begins the story as a talented athlete with no real idea of the how professional football is played. To use parlance that will be familiar to most players of video games, Devin has absolutely no clue about the Meta game of American football. As a result, a good portion of Longshot is dedicated to teaching Devin (and through him the player) the Meta he’s missing, and that’s as about as exciting as it sounds. At one point the game has you play a mini-game where you hear how a quarterback calls plays, and then you use the controller to repeat them back. Basically it’s the moment in any football movie where the quarterback calls out “Blue 32! Blue 32!” before snapping the ball. At one point the defacto antagonist of the single player campaign commented that watching this is boring, and I couldn’t help but agree. It was even frustrating since I replayed a few segments and got the same result regardless. Overall Longshot is like a roller coaster, you are just along for the ride and have to wait for the first climb before the fun starts; however, if you are willing to wait you will have a fun ride. After you complete the (roughly) eight-hour Longshot campaign, there are still hours and hours of content left to play. 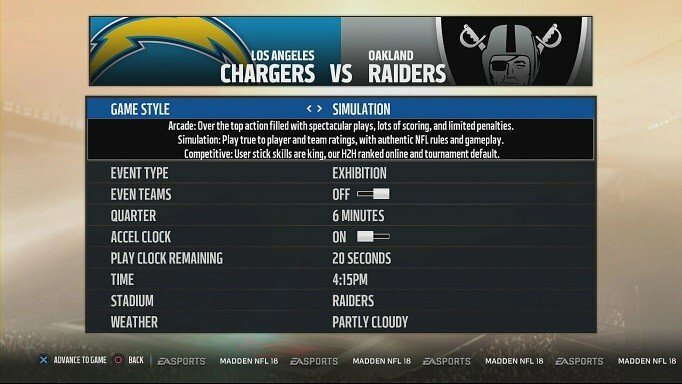 You will probably want to start off with the MUT mode since a lot of Longshot related stuff will be now be unlocked there, including a bunch of Longshot specific challenges. 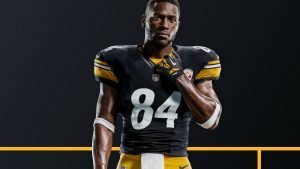 Madden NFL 18 might have the most content for any videogame at the same price point, but it is all variations of playing football. You can play offline against the A.I. in a single game, you can play offline against the A.I. 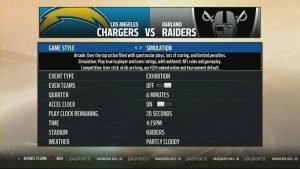 in a season of games, you can play the with two other friends in the new MUT Squads mode, you can play single games online with other people, and the list goes on and on. You can also choose what style of game you want to play. Playing in arcade mode will remind some people of Blitz: The League. There is no drug use in Madden NFL 18 like there was in Blitz: The League, but the catches are just as unrealistically impressive. From there you can go up various levels of realism until you reach an extremely accurate simulation of NFL football. On top of that, these modes do not determine how difficult the gameplay will be since you pick your difficulty level separately. You can go for the extremely hard arcade experience or a pushover simulation—the choice is yours. Regardless of how you set up your personal Madden experience, the level of polish will be the same: generally, very high. There are visual parts of this game that are literally the best graphics I have ever seen from a console, and I mean head and shoulders above the competition. This is also why it is so confusing to see last generation graphics in the Longshot mode. It is really easy to tell what parts of the game Tiburon has worked on for years, and what parts are brand new for Madden NFL 18. 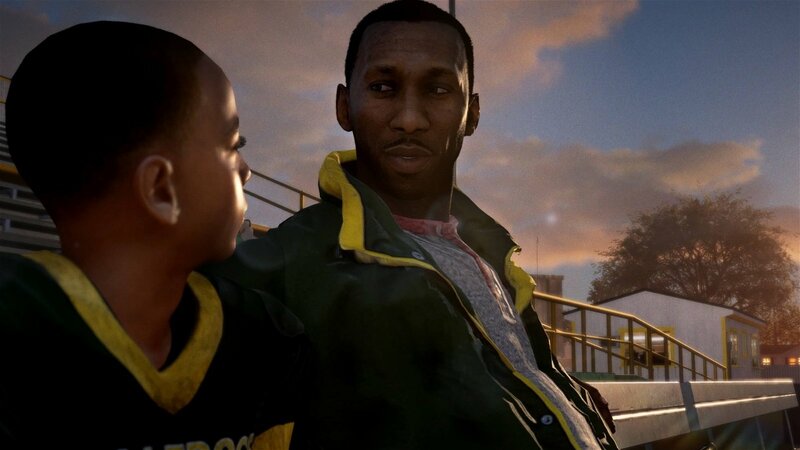 The new stuff is all in the Longshot campaign and does not look like it was modeled for this generation; so much so, that shifting between on-field and off-field scenes in Longshot is jarring at times. Wondering why a British lady has giant immobile mannequin hands in a 2017 AAA release is even weirder after seeing how they got the reflection in a helmet to look so realistic. I am pretty sure Tiburon cut a few corners as well. This is because at one point you flash back to Devin Wade playing high school football and all of Devin’s teammates on the sidelines look to be around 30 years old. When you play any mode that is not Longshot the level of detail is impressive to behold. 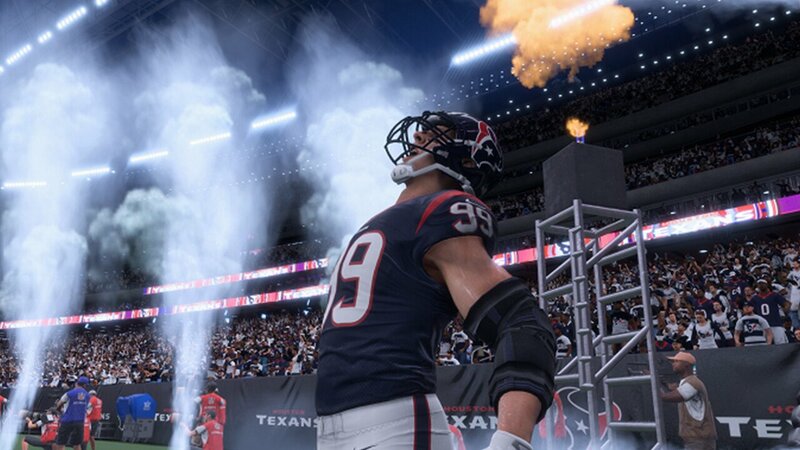 The player models, their equipment, the stadiums they play in, the fake TV overlays and other aspects of the on-field game-play are so defined and detailed that I feel like I need to come up with a new word to describe it; therefore, I will simply say that the use of the Frostbite engine has had a very positive change for the Madden franchise. Trust me when I say that you will wish every game you play was this detailed. The only real visual issues I had outside of the Longshot mode were the odd clipping between on-field characters and the occasional camera angle that was blocked by some object. Luckily, these were only the between-play camera angles, so it did not affect gameplay. The rest of the game is mostly kick returns for touchdowns with the rare interception here or there. If you have no idea what that means I will simply add that the majority of the audio and play-by-play in the game is solid. As with all sports video games, the play-by-play commentary will become repetitive before you are bored with the game itself, but it also has heart since it insulted me every time I skipped the half-time show. The soundtrack is cool with songs from Kendrick Lamar, Imagine Dragons, Snoop Dogg, and others; however, nothing really stands out in that area. There was a weird audio glitch that happened during the first game I played that caused all the play-by-play commentary to stutter, but after that everything sounded fine. The A.I. that you will be competing against is programmed well and will provide a challenge at any level—although, the A.I. locked up from time to time. This would usually happen when Player A would freeze in place like a statue as it waited for Player B to get in position for a pass. It was an odd thing that was super distracting, but Madden NFL 18 also includes a bunch of random animations and player interactions (like players slipping in wet grass) spread across the game. This means that the A.I. control characters usually appear to be more human than robot. 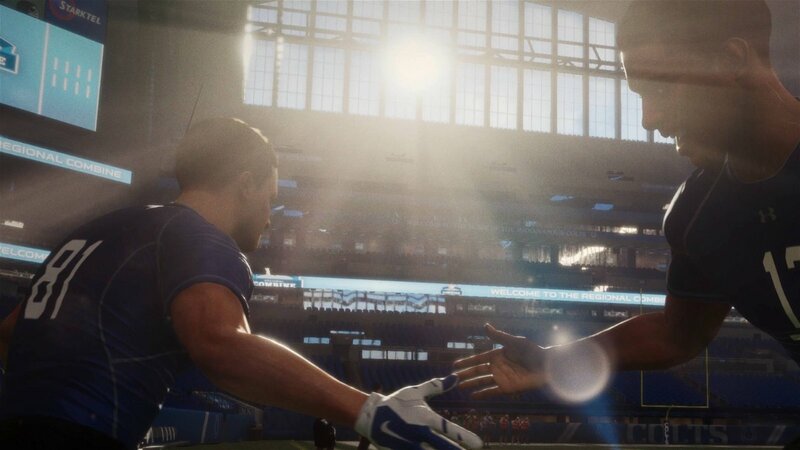 Madden NFL 18 has become the most interesting game in the franchise, and it really does offer something that everyone can play. That said, it is still 100% Grade-A American football, and if that’s not what you want to snack on then I would suggest you hold off until the September gaming buffet opens. Madden NFL 18 is also one of the best-looking games I have ever seen, at least when you are playing football. It has a few bugs here and there, but so does every other game. What Madden NFL 18 offers is well made, but it is also $80 CDN. With that in mind, if you only want to play the Longshot mode I would suggest you wait. The Longshot mode is cool, but I was never convinced that it was $80 cool. On the other hand, if you will play more of Madden NFL 18 than Longshot then I can think of no reason to turn it down. Finally! A football game that literally anyone could play, but that does not mean everyone will enjoy it.